I had an interesting conversation today with a person that had expressed interest in doing business with me in the past couple of months. Today, however, the tone was very different. This person was very upset and defensive (and also apologetic). What changed since that original excitement? The complete answer will have to be left to that person. However, it brought this quote back to mind: “Everyday Stand Guard at the Door of Your Mind!”. 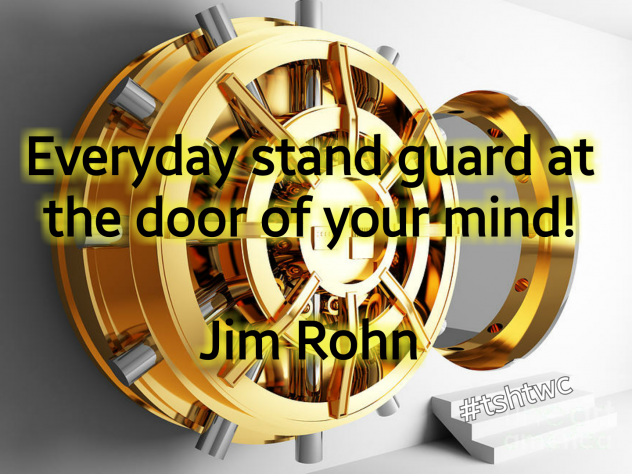 It is a fairly famous quote in the entrepreneur milieu by Jim Rohn, a successful entrepreneur, coach and author. What does this statement mean? The mind is fascinating; some say it is mad. I think it is beautiful. More and more scientific research is showing how it works and it demonstrate what shamans have known for eons: we create our reality. Not so long ago, we “discovered” that our genetic material has an influence on our health. Soon thereafter, we found that the epigenome was actually controlling (forgive my oversimplification) the chromosomes in our genome. Basically our genetic material expresses itself at the epigenome’s “will”. Furthermore, we found that the epigenome is affected by our lifestyle. Lifestyle is defined as “the habits, attitudes, tastes, moral standards, economic level, etc., that together constitute the mode of living of an individual or group” by dictionary.com All these relate to our thoughts and emotions (or lack thereof). Therefore our chromosomes are affected by our lifestyle; affected by our thoughts and emotions. Take a minute do digest this thought. It is pretty powerful and perhaps a little scary to some. Are our thoughts that powerful? Are we that powerful? It is easy to want to reject that responsibility. And that is what we often do. We allow tv, movies, music, food, friends to “soothe” us and project unto others that power that belongs to us. And this is why this quote is so very important. We can not control people directly like in the movies, but we can certainly influence them. And if we apply enough repetition to our influence it can have potent effect on our mind including the subconscious part which is much faster and more potent than the conscious. Therefore we must stand guard of everything that comes our mind’s way and carefully select who and what we let in. It can make us happy or sad, rich or poor, healthy or sick. If you need help with your mindset and achieving your health and life goals, feel free to reach out to me here. And please leave comments below. I am happy to see your thought on the subject.